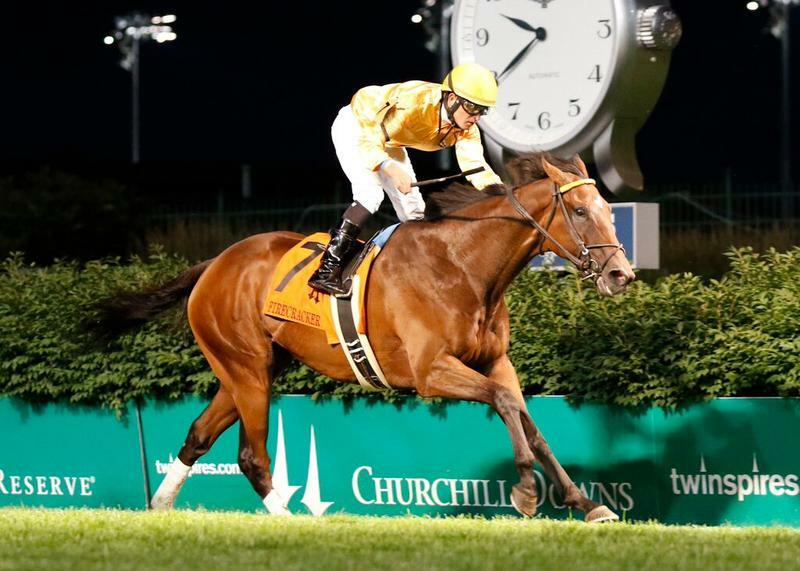 Adele Dilschneider and Claiborne Farm’s Departing looks to add another stakes victory to his résumé in Saturday’s third running of the $175,000 Lukas Classic (formerly known as the Homecoming Classic), a 1 1/8-mile race for 3-year-olds and up at Churchill Downs. 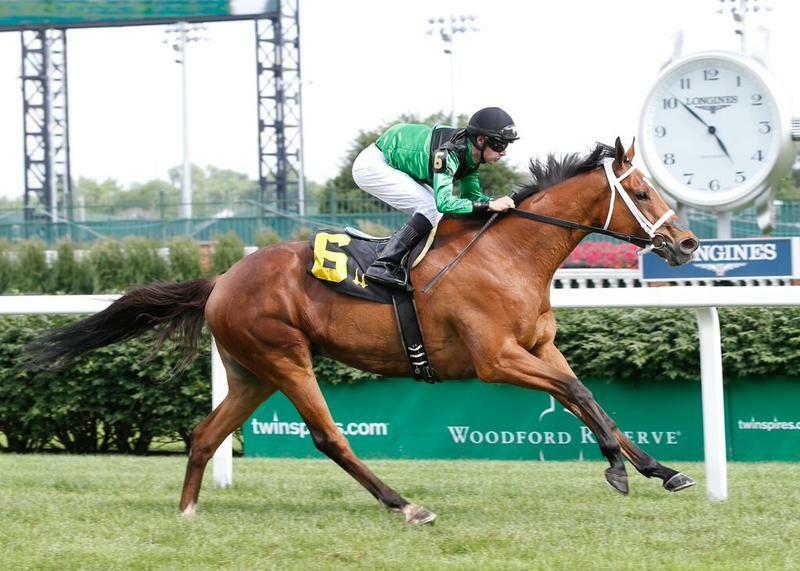 The 5-year-old homebred son of War Front is the winner of five stakes races, including four graded stakes events: the Texas Heritage Stakes, Illinois Derby (GIII), West Virginia Derby (GII) and Super Derby (GII) at age 3 and the Firecracker (GII) on turf at Churchill Downs this summer. Trainer Al Stall Jr. believes that the Lukas Classic is the right spot for Departing to capture yet another stakes race. Following his Firecracker victory, Departing made two starts, both off-the-board efforts in the A.G. Vanderbilt (GI) at Saratoga and the More Than Ready at Kentucky Downs where he finished seventh and fourth, respectively. Stall admits that these may not have been the best races for his horse. Departing was second in last year’s Lukas Classic behind Jake Ballis and Rashard Lewis’s Cigar Street. Brian Hernandez Jr. takes over the riding duties from Robby Albarado, who will pilot Geothermal. ULANBATOR SEEKS SECOND STRAIGHT STAKES WIN IN LUKAS CLASSIC – Mary Ann Charlston’s Ulanbator, who scored his first stakes victory last time out in the Michael G. Schaefer Mile on July 18 at Indiana Downs, will attempt to land his second straight stakes win in Saturday’s $175,000 Lukas Classic. A winner in three of seven starts this year, trainer Ian Wilkes believes he has the 4-year-old colt ready for a return to competition after a 70-day break. A start in the $5 million Breeders’ Cup Classic (GI) at Keeneland on Oct 31 would be out of the question, according to Wilkes, even if the horse does win on Saturday. Jockey Julien Leparoux, who guided Ulanbator to a victory last time out, has the mount for Saturday’s race. The Lukas Classic field from the rail out (with jockey and morning line odds): Hesinfront (Corey Lanerie, 15-1), Abraham (Joe Rocco Jr., 12-1), Ulanbator (Julien Leparoux, 7-2), Departing (Brian Hernandez Jr., 7-2), Irish You Well (Channing Hill, 5-1), Mylute (Florent Geroux, 2-1), Smack Smack (Shane Laviolette, 10-1) and Geothermal (Robby Albarado, 8-1). HIGH NOON RIDER INVADES FROM NEW YORK TO TACKLE JEFFERSON CUP – R.A. Hill Stable’s High Noon Rider is headed to Churchill Downs from New York with hopes of finding his first graded stakes victory in Saturday’s $100,000 Jefferson Cup (GIII) for 3-year-olds at one mile on Churchill Downs’ Matt Winn Turf Course. Rated a 4-1 co-second choice on odds maker Mike Battaglia’s morning line, the homebred son of Distorted Humor comes into the race off of a wire-to-wire victory in the Better Talk Now at Saratoga for trainer George Weaver, who is looking to keep his horse up against fellow 3-year-olds. Weaver also chose the Jefferson Cup because he believes his horse excels at the one-mile distance where he has won two of four starts. Generally not a front runner, High Noon Rider set the pace last time out winning the Better Talk Now in gate-to-wire fashion. According to the trainer, one can expect him to be up close to the pace in Saturday’s race as well. Weaver will be in town to saddle High Noon Rider in Saturday’s race. Leading rider Corey Lanerie has the mount. FLASHY CHELSEY SEEKS TO GIVE VETERAN TRAINER O’CONNOR FIRST GRADED STAKES WIN – Bruce McCrea’s Flashy Chelsey will attempt to give long-time Churchill-based trainer Rob O’Connor II his first graded stakes victory when the 3-year-old goes to post in Saturday’s Jefferson Cup. The homebred son of Flashy Bull has never finished off the board in his last seven starts, all of which have been on the turf. McCrea and O’Connor claimed Flashy Chelsey for $30,000 at last year’s September Meet following a victory in a maiden claiming event at Churchill Downsbased off of the horse’s family history. O’Connor trained both the dam What’d I Say and the granddam Musical Miss. “I know the horse’s family really well and it seems to have worked out well from there,” O’Connor said. “Prior to the time that I had claimed him he looked like a predominately speed horse. But as we gave him the time off and he grew, we figured out that’s not what we wanted to do. So when we started bringing him off the pace and saw his true ability, he was doing things that were impressive to me. When the rider would back off of him and when he would get it together he would start running. I was telling my clients that he was doing things that people aren’t seeing and that he’s a better horse. O’Connor’s ultimate goal with Flashy Chelsey would be to run at Gulfstream Park in the Claiming Crown at the end of the year. Francisco Torres, the pilot in his last four starts, returns to the saddle for the Jefferson Cup. Torres entered Friday’s action needing five victories to reach the 3,000 career-win milestone. The Jefferson Cup field from rail out (with jockey and morning line odds): Nun the Less (Florent Geroux, 7-2), Sylven Park (Sophie Doyle, 12-1), Cat Humor (Brian Hernandez Jr., 10-1), High Noon Rider (Corey Lanerie, 4-1), Watchyourownbobber (Julien Leparoux, 8-1), Wayward Kitten (Rafael Hernandez, 15-1), Syntax-IRE (Shaun Bridgmohan, 4-1), Pride of Stride (Robby Albarado, 12-1), Flashy Chelsey (Francisco Torres, 12-1), Wild and Unbridled (Erin Walker, 15-1) and Saham (Joe Rocco Jr., 8-1). MIDNIGHT CELLO RETURNS TO DIRT FOR GRADE III ACK ACK – Patricia’s Hope LLC’s Midnight Cello will be returning to the Churchill Downs main track for Saturday’s $100,000 Ack Ack Handicap (GIII) after making two starts on the synthetic Polytrack surface. The son of Midnight Lute trained by Mike Tomlinson was last seen finishing second in the Presque Isle Downs Mile earlier this month behind Florida Won. Prior to that, he triumphed in the Hanshin Cup (GIII) at Arlington Park. Those were the 5-year-old’s only starts over synthetic surfaces. “That was an experiment starting off and it turned out to be a successful one,” Tomlinson said. “He seems to love the synthetic track. Tomlinson acquired 5-year-old Midnight Cello for Vince Foglia’s Patricia’s Hope LLC through a $100,000 claim at Gulfstream Park last December. Midnight Cello is cross-entered in the $50,000 Teleprompter at Arlington Park but will scratch from there to compete in the Ack Ack. Florent Geroux, the pilot in his two most recent outings, will be aboard for Saturday’s race. The Ack Ack field from the rail out (with jockey and morning line odds): Den’s Legacy (Calvin Borel, 10-1), Agent Di Nozzo (Joe Rocco Jr., 5-1), Midnight Cello (Florent Geroux, 3-1), Hat of Jacks (Francisco Torres, 30-1), Tapiture (Ricardo Santana Jr., 7-5), Viva Majorca (Julien Leparoux, 3-1) and Roman Unbridled (Jon Court, 30-1). TEPIN, THE PIZZA MAN, WORK ALL WEEK PUT IN FINAL BREEZES BEFORE KEENELAND STAKES – Midwest Thoroughbreds’ The Pizza Man and champion sprinter Work All Week put in their final breezes Friday morning in preparation for next weekend’s stakes engagements on opening weekend at Keeneland. The Pizza Man and Work All Week breezed four furlongs separately in :49.80 and :47.40, respectively. The former will go in the $1 million Shadwell Turf Mile (GI) on Oct. 3, while the latter will run in the $400,000 Phoenix (GIII) on Oct. 2. Regular jockey Florent Geroux was aboard both horses for their breezes. Richard Papiese, owner of Midwest Thoroughbreds, was at Churchill Downs on Friday morning to watch both of his horses work and liked what he saw. Papiese discussed the success that both horses have achieved and how he had high hopes for both of them from the beginning. Also on the Churchill Downs work tab Friday was Robert E. Masterson’s Tepin, who breezed a half-mile in :49.40 with Julien Leparoux up. Norman Casse, assistant to his father Mark, says the daughter of Bernstein remains on track for the $400,000 First Lady (GI) on Oct. 3 at Keeneland. 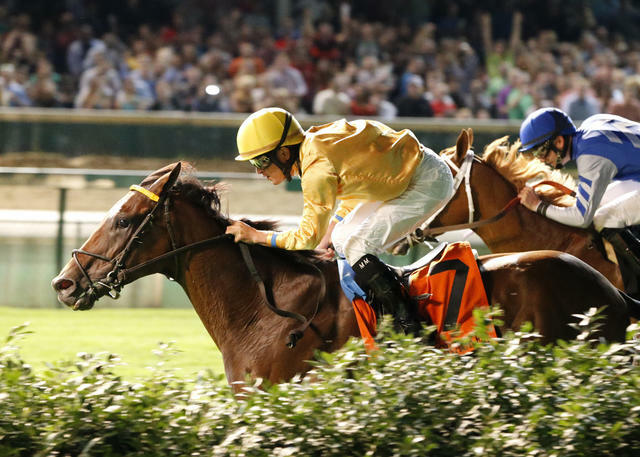 Should she win said race, Casse would likely start her in the $2 million Breeders’ Cup Mile (GI) against males. Coming off of two second-place efforts on grass in the 1 1/8-mile Diana (GI) and 1 1/16-mile Ballston Spa (GII) at Saratoga, Casse is looking forward to shortening back up to one mile. LUKAS ‘DOING BETTER’ ACCORDING TO ASSISTANT TRAINER – Hall of Fame trainer D. Wayne Lukas continues to show improvement after being hospitalized on Saturday morning due to a low heart rate, according to assistant trainer Sebastian “Bas” Nicholl. “He’s doing well right now, hopefully they release him soon,” Nicholls said. “I spoke to him a few times this week and he seems to be doing better. He’d like to try and drive back here on Saturday. They’re going to try and leave there on Saturday morning, that’s what he hopes for but that’s not guaranteed. Nicholl believes that “The Coach” will be “ready for some action” upon returning to Louisville. 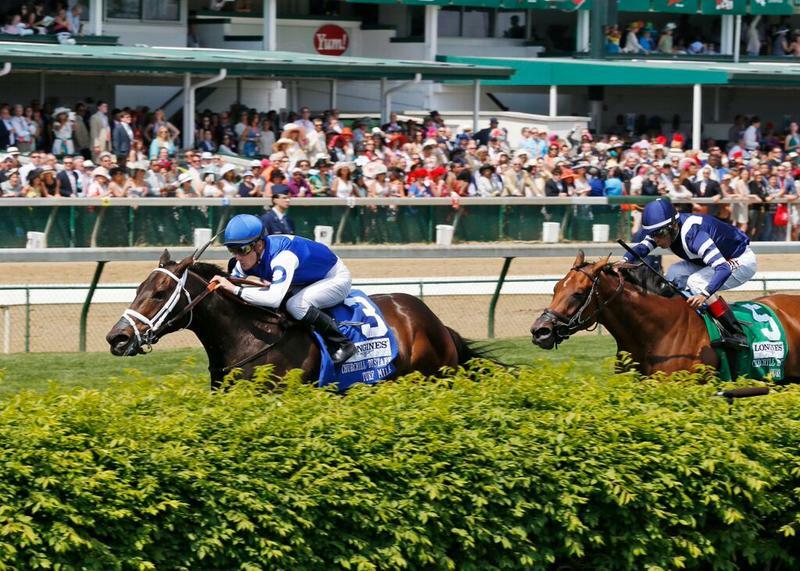 ‘INSIDE CHURCHILL DOWNS’ TO AIR SATURDAY AT 11 A.M. ON 93.9 THE VILLE – “Inside Churchill Downs,” the horse racing radio show co-hosted by Churchill Downs Racetrack’s John Asher and Darren Rogers, will air Saturday from 11 a.m. to noon on 93.9 The Ville.